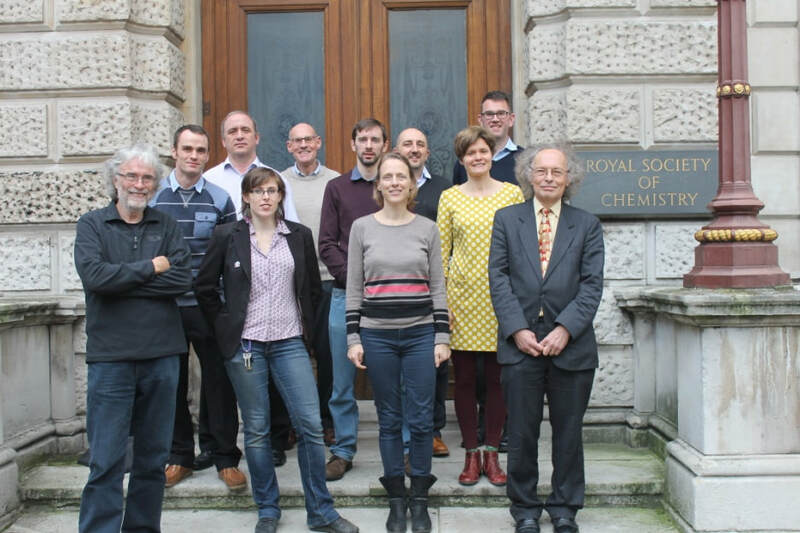 At our March 2018 Annual General Meeting, we bid farewell to six members of the Environmental Chemistry Group (ECG) committee (Dr Rupert Purchase, Dr Julia Fahrenkamp-Uppenbrink, Professor William Bloss, Professor Martin King, Mr Ian Forber and Mr Brian Graham) and welcomed four new members (Dr Valerio Ferracci, Professor Dominik Weiss, Dr Clare Topping and Dr David Owen). Here in this article we pay tribute to the contributions that our departing members made during their time serving on the committee. Figure 1. From back left to front right: Ian Forber, Rupert Purchase, Martin King, Brian Graham, Jamie Harrower, Tom Sizmur, Zoë Fleming, Steve Leharne, Rowena Fletcher-Wood, Julia Fahrenkamp-Uppenbrink, Roger Reeve. Aluminium in Food and the Environment, eds. R. C. Massey and D. Taylor, Royal Society of Chemistry, Cambridge, 1988. Food Contaminants: Sources and Surveillance, eds. C. S. Creaser and R. Purchase, Royal Society of Chemistry, Cambridge, 1991. The Laboratory Environment, ed. R. Purchase, Royal Society of Chemistry, Cambridge, 1994. Environmental Impact of Chemicals: Assessment and Control, eds. M. D. Quint, D. Taylor, and R. Purchase, Royal Society of Chemistry, Cambridge, 1996. Together with colleagues from the ECG committee, Rupert produced over 15 issues of the ECG Bulletin. These pioneering actions by Rupert laid the groundwork for the committee members that followed, and set the standards which we, as current committee members, hope to uphold. Dr Julia Fahrenkamp-Uppenbrink joined the committee in 2011 and assumed overall responsibility for the editorship of the ECG Bulletin between 2011 and 2017. During this time, she was chiefly responsible for sourcing articles, editing them, and producing the ECG Bulletin with help from several ECG committee members. Julia, as a professional editor, brought a new skill set to the committee, and spearheaded innovation in the design of the ECG Bulletin to make it easier to produce and read. Successful aspects of the redesign were to define clear article types, to publish shorter pieces and to streamline the production process. Julia also wrote several pieces for the ECG Bulletin herself and elevated the rigour of the editorial process to ensure that all the articles followed a consistent style. The work that Julia did in transforming the ECG Bulletin has substantially helped the ECG committee in going forward, as the well-defined steps and the simplified production process have made it easier for several people to assemble the ECG Bulletin today. Professor William Bloss joined the ECG Committee in 2008 as the Atmospheric Chemistry Representative and, in this role, organised several scientific meetings, including a new event for early career atmospheric chemists that combined scientific presentations with a careers panel advising them on future career directions. Bill was elected as the Chair of the ECG from 2012 to 2014, and held the position of Vice Chair both before and afterwards (2010 to 2012, and 2014 to 2016). He also served as the ECG representative on the Environment, Sustainability and Energy Division from 2011 to 2015, representing the views of the ECG committee at a higher level within the RSC. In March 2018, as Bill was stepping down from the committee, he was awarded a commemorative plate in recognition of 10 years of service to the ECG committee. Professor Martin King joined the ECG committee in 2012 and established a series of ‘Environmental Briefs’ which have been published in the ECG Bulletin since 2013. These two page articles, all of a similar style, aim to bring concise but authoritative information about aspects of the environmental sciences to members of the Environmental Chemistry Group and to all those with an interest in chemistry of the environment. At least two Environmental Briefs have been included in each ECG Bulletin edition since their conception. Martin also served as Honorary Secretary from 2013 to 2015, as Chair from 2015 to 2016 and as Vice Chair from 2016 to 2018. He served as the ECG representative on the Environment, Sustainability and Energy Division, and joined their prize panel between 2015 and 2017. Mr Ian Forber joined the ECG committee in 2013. Soon afterwards he took on the task of updating the ECG web pages on the RSC website. This project developed into a long-term technical role until he left the committee in 2018. Ian served as the ECG treasurer from 2015 to 2018, during which he navigated the committee through some major changes to the way in which RSC interest groups are funded, and established new funding policies. Ian also helped organise several scientific meetings, including the 2015 Analysis of Complex Matrices meeting. Mr Brian Graham joined the committee in 2015 and contributed to the organisation and delivery of several events and scientific meetings, including our early career researcher conferences in 2016 and 2017. He also wrote and edited several ECG Bulletin articles. We thank our departing members for their outstanding service to the ECG committee and wish them all the best in their future endeavours. Figure 2. 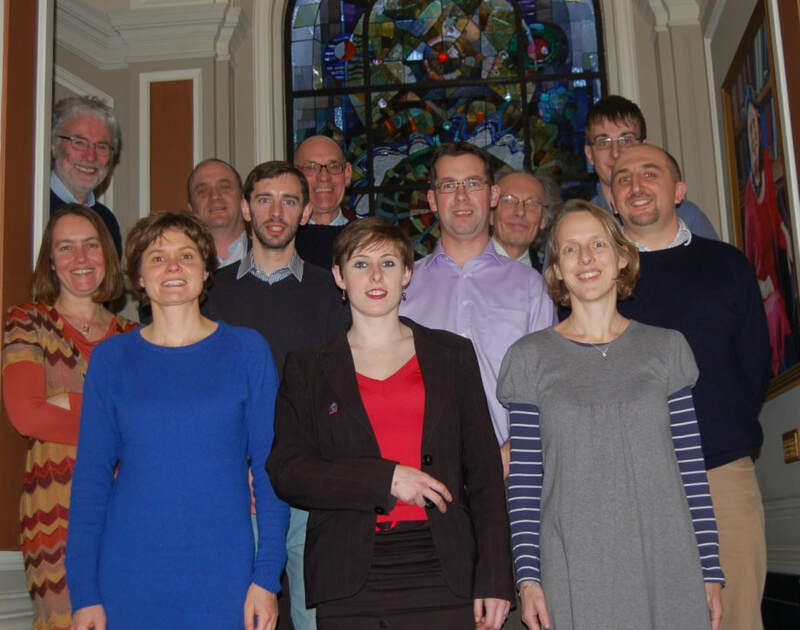 From back left to front right: Steve Leharne, Ian Forber, Rupert Purchase, Roger Reeve, James Lymer, Jo Barnes, Tom Sizmur, Bill Bloss, Martin King, Zoë Fleming, Rowena Fletcher-Wood, Julia Fahrenkamp-Uppenbrink.